This FAQ article will describe how to enable, configure and use the XTAM HTTP Proxy feature. If you want to first understand, conceptually, how it works, please review our XTAM HTTP Proxy Overview. Xton Access Manager provides quick, easy and reliable methods to create secure, password-less sessions to remote endpoints using the most common protocols like RDP, SSH, VNC, Telnet and others. In this article we will describe the configuration required to expand our supported protocols to enable secure remote sessions to websites, portals or custom web applications. For the Table of Contents, please note which person is responsible for each step. For System Administrators, they will need to complete steps 1-3 (and optionally 4), while users are responsible for only steps 4 and 5. There are several configuration options presented in this guide, so we recommend reading through the entire article first, then deciding which is most applicable for your needs and requirements before you begin the deployment. HTTP Proxy: Switch this option to Enabled and click the Save button to its right. HTTP Proxy Port: Use or change the port value that XTAM will use for HTTP proxy and click the Save button to its right. Proxy Domains are only required if you are using the XTAM Browser Extension for proxy configuration. If you are using .pac scripts, then this field may be left empty. HTTP User Placeholder: Use the default or change the value to what you want user’s to have to enter in the website’s User login field. HTTP Password Placeholder: Use the default or change the value to what you want user’s to have to enter in the website’s Password login field. These placeholders values are what you will give to your users that they will then enter into the web portal’s login form. This is not the actual username and password for the web portal itself, which will be stored in the XTAM record later in this guide. Once both settings have been updated and saved, restart the PamManagement service (Windows) or pammanager service (Unix/Linux). When the services is fully restarted (can take 1-5 minutes), the HTTP proxy module is online. In order for XTAM to process these web domains, they must be properly included in either your corporate proxy setup or your browser’s network proxy configuration. All scenarios will be described now, however you may only need to implement one method to use XTAM’s HTTP Proxy feature. This example will assume your corporate proxy is defined using a deployed .pac script. There are several other methods that can be used for proxy configuration, so if you are unsure please contact your Network Administrator for assistance. Access your .pac file and add an entry for each domain that will be used by XTAM’s HTTP Proxy feature. These domains should return to the XTAM host followed by the HTTP Proxy Port mentioned earlier. Here is an example that can be used for guidance. Adjust the values and syntax as needed. Once complete, save and redeploy this pac file. This example will assume you want to configure the network proxy in only specific browsers. This can be done using Windows Proxy Settings (in the case of Internet Explorer or Google Chrome) or the browser’s Proxy Settings (in the case of Mozilla Firefox). 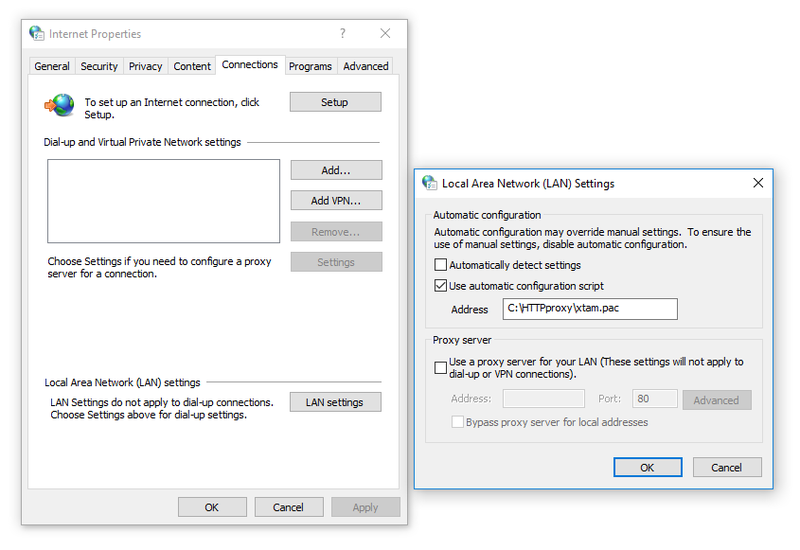 Open your Windows Internet Options, navigate to the Connections tab and choose the LAN settings option. Check the Use automatic configuration script and enter the path to the location of your .pac script. Click OK when finished. Open the browser’s Options menu, locate its Network Proxy section, click Settings and then enable its Automatic proxy configuration URL by selecting or entering the path to the location of your .pac script. Click OK when finished. Alternatively, you can use the XTAM Browser Extension available in either the Chrome or Firefox store. The use of this extension will allow for the automatic configuration of the proxy settings (Enable and Disable) so the end user does not need to modify settings, scripts or files manually. 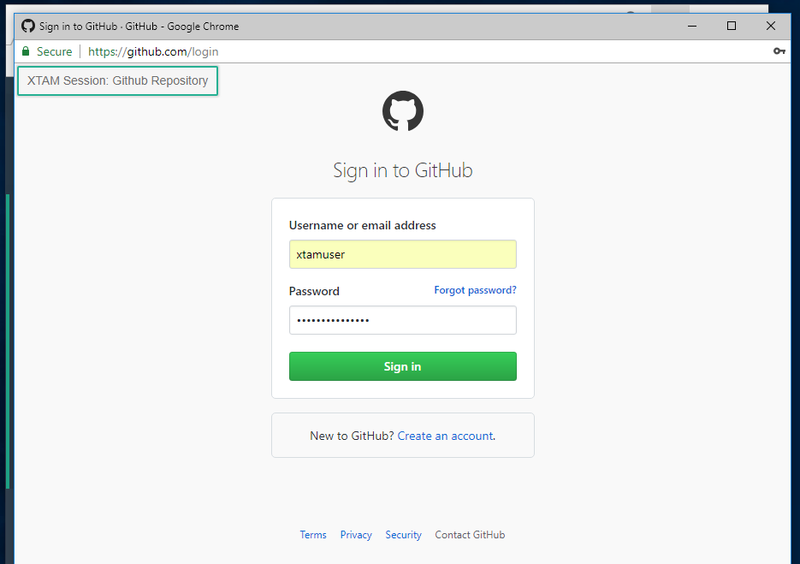 To use the XTAM Browser extension, simply locate the extension in your browser’s store and deploy it as usual. 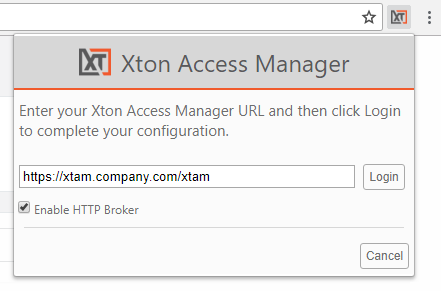 When deployed, click the Gear icon to define your XTAM host URL (for example, https://xtam.company.com/xtam), check the box to enable the HTTP Broker and then finally click Login to complete the process. When this entire process is complete, the extension will make the necessary adjustments to the browser’s proxy configuration to enable XTAM’s HTTP Proxy feature. Please note that the XTAM browser extension is now controlling specific domains using proxies settings in your browser and therefore your browser may display a message indicating this behavior. This is the expected behavior and you should accept this message to continue using the extension for XTAM HTTP proxy sessions. In XTAM, create a new record using the record type Web Portal. Populate all the fields with your endpoint’s connection details. User: Enter the username of the account that will be used to login to the website. Please note that the User and Password values defined in the Web Portal record are the actual login credentials for the web portal. This is different than the HTTP Placeholders that are defined in the XTAM Administrator Settings. Click the Save and Return button. Your record is now saved and under management in XTAM. Permissions and workflows can also be applied to your users or groups ensuring only authorized personnel can access to the record. In order for the HTTP Proxy to work properly with secured connections, you will need to import XTAM’s certificate into Windows or your browser directly. This step needs to be performed on the user’s computer, not the server that hosts XTAM. If possible, you Network or Security Administrators may be able to deploy the certificate to the computers on behalf of the user(s). Please work with your internal IT department for further assistance. Navigate to Management > My Profile > Preferences and click the Download button for Certificate. Save the certificate file somewhere safe on your computer. For Certificate Store, select Place all certificates in the following store, click Browse and then select Trusted Root Certificate Authorities. After the certificate imports successfully, restart your browser. In the Trust section, for the option When using this certificate, select Always Trust in the dropdown menu and then close this certificate popup. Now that the HTTP Proxy feature has been configured, proxy configuration has been created and the Web Portal record exists in XTAM and the certificate was imported, it is time to Connect to the web session. Login to XTAM with an account that has Connect permissions to this record. Open the record and click the Connect option. A new browser tab or window will open to the URL that was defined in the record. You will notice that a popup appears in the upper left indicating that this is a proxy-ed XTAM Session (XTAM Session: Record Name). On the web portal’s Username field, enter the HTTP User Placeholder value, not the User value defined in the record itself nor your login account to XTAM. On the web portal’s Password field, enter the HTTP Password Placeholder value, not the Password value defined in the record itself nor your login password to XTAM. Click the web portal’s Login or Sign In button to initiate the authentication process. 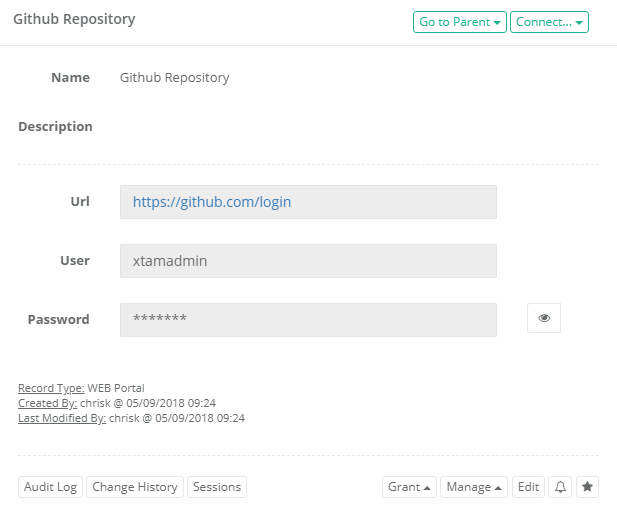 At this time, XTAM will replace the Placeholder credentials entered in the web portal’s login form with those defined in the record and login the user. This process will not disclose the actual login credentials and will be entirely invisible to the end user. The user will now be logged into the web portal with the credentials defined in the XTAM record. To confirm that the session is being provided via XTAM, you can navigate to the Session tab of this record and note that there is now an Active session for this user. When the User is finished, they can simply Logout of the web portal and close their browser window or tab to complete the active XTAM session.